The automotive catalyst is used in the exhaust system of vehicles to control the emission of harmful gases, such as hydrocarbons, carbon oxides, nitrogen oxides, and other particulate matter, into the atmosphere. It helps convert harmful gases into less toxic gases such as nitrogen and carbon dioxide. Platinum, palladium, rhodium, and other rare and expensive metals are used as catalysts in automobiles, which increases the cost of the automotive catalyst. However, manufacturers are inclined towards adopting nanotechnology to enable them use expensive metals efficiently. The governments of developed countries have established emission control standards to control release of pollutant from vehicles into the atmosphere. For instance, Euro 6, European emission standards is a European government initiative for emission control in the European region. Factors such as emission control regulations by government and increase in the production of automobiles fuel the growth of the automotive market. Automobile manufacturers produce vehicles with emission control technologies to meet the stringent regulations set by the government. However, rise in penetration, and production of electric vehicles hinders the growth of the automotive catalyst market. In addition, high cost of precious metals such as platinum, palladium, and rhodium used in automotive catalyst restrains the growth of the market. Furthermore, government initiatives regarding emission control in developing nations and innovation in emission technologies for fuel efficiency are anticipated to provide remarkable future growth opportunities to the automotive catalyst market. The key players operating in the global automotive catalyst market are BASF SE, Johnson Matthey, Umicore, Tenneco Inc., CDTi Advanced Materials, Inc., Cummins Inc., Eberspcher, Ecocat India Pvt. Ltd., Klarius Products Ltd., Clariant, and others. The governments of several countries have established stringent regulation for pollutant gas emission from the vehicles because of the combustion of fuels such as diesel fuel, fuel oil, petrol, gasoline, biodiesel, and others. Euro 6 is the latest emission regulation by European Union directive to reduce harmful gases such as carbon monoxide (CO), nitrogen oxide (NOx), hydrocarbons, and others from the exhaust system of the vehicle. Similarly, the automotive catalyst is used in catalyst converter, an emission control device used to convert toxic and harmful gases from engines into less-toxic pollutants. The catalyst also adheres to the vehicle emission standards. Thus, strict emission standards by government fuel the growth of the automotive catalyst market. The developing nations have witnessed a surge in demand and production of automobiles. For instance, India became the fourth largest automobile industry in the world with the increase in sales of 9.5% year-on-year to 4.2 million units. This rise in automobile production in developing nations automatically leads to increased production in demand for automotive catalysts for emission control devices in automobile exhaust systems. Therefore, increase in automobile production is anticipated to boost the growth of the automotive catalyst market. In recent years, there is a significant increase in the demand and production of electric vehicles, as these vehicles have several advantages over fuel-powered automobiles. Components, such as fan belts, oil, air filters, head caskets, timing belts, cylinder heads, and spark plugs does not require replacement, which in return makes it cheaper and efficient compared to fuel-powered automobiles. This makes electric vehicle a preferred choice, which in return restraints the growth of the fuel-powered automobile markets. Thus, increase in production of electric vehicles hinders the growth of the automotive catalyst market. The key players of the automotive catalyst market are investing on the improvement and development of catalysts. A three-way catalyst can reduce the emitted pollutant from vehicle at 100% conversion efficiency at its operational temperature, typically above 400C, which is much higher. Johnson Matthey Inc., a leading automotive catalyst producer is working on the development of three-way catalyst for future vehicle, which improves the fuel efficiency and reduces CO2 emission substantially at lower operating temperature. This innovation in automotive catalysts is anticipated to provide future growth opportunity to the automotive catalyst market. This study comprises the analytical depiction of the global automotive catalyst market analysis along with the current trends and future estimations to depict the imminent investment pockets. 8.5. Clean Diesel Technologies, Inc.
8.8. 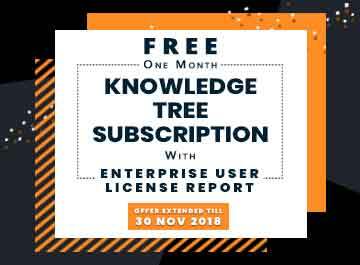 Ecocat India Pvt. Ltd.
Catalyst is a compound or agent added to increase the rate of reaction without participating in the actual reaction. Similarly, an automotive catalyst is used in the vehicle’s exhaust system to control emission of harmful gases into the atmosphere. Emission from vehicles such as light-duty vehicle, heavy-duty vehicle, and others generally consist of toxic pollutants such as hydrocarbons, carbon oxides, nitrogen oxides, and other particulate matter. Automotive catalyst helps to convert these gases into less toxic gases such as nitrogen and carbon dioxide. Emission control regulations by government and increase in the production of automobiles fuel the growth of the automotive market. Automobile manufacturers are producing vehicles with emission control technologies to meet the stringent regulation set by the government. However, rise in penetration and production of electric vehicles hinders the growth of the automotive catalyst market. In addition, high cost of precious metals such as platinum, palladium, and rhodium used in automotive catalyst restrains the growth of the market. Among the analyzed geographical regions, Asia-Pacific is expected to account for the highest revenue in the global market throughout the forecast period (2018–2025), followed by Europe, LAMEA, and North America. 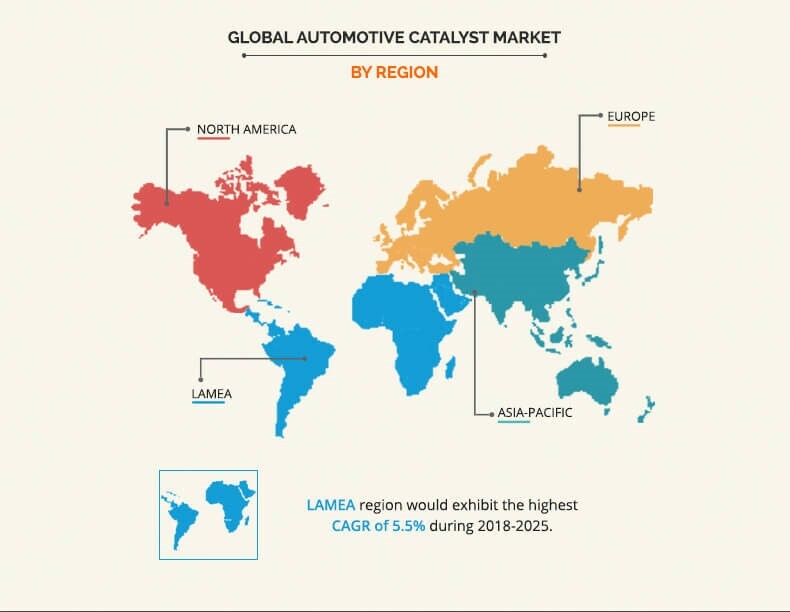 Moreover, LAMEA is expected to witness the highest growth rate, owing to the increase in usage of automotive catalyst in developed countries, such as Brazil, Chile, Argentina, and others. This indicates lucrative prospects for automotive catalyst providers in the LAMEA region.